Children in the for-profit foster care system are dying at alarming rates, but the deaths are not being investigated, and autopsies are not even being attached to the now-closed case files, a two-year bipartisan investigation by the Senate Finance Committee has found. If that's not horrible enough, consider this: the report came out yesterday, and it zeroed in on a for-profit foster care provider, the stock price of that company sank. The next day, as it became apparent that nobody cared, the stock jumped back up. 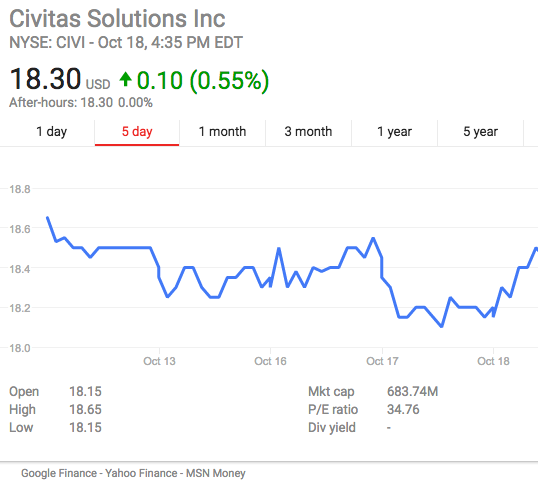 (The company is Civitas Solutions, trades as CIVI on the NYSE.) Look at this move from Oct. 17th-18th. Longtime readers of this email may remember coverage from last year of the fight over the Families First Prevention Services Act. It's a bill that tried to flip the foster care system rightside up. As of now, all the incentives -- cultural, legal, political and financial -- push in the direction of pulling kids out of dysfunctional homes and sticking them into the foster care system, where they often wind up warehoused in group homes. The first part of that has a natural appeal: it feels wrong to leave a child in what could be an unsafe environment, and if something bad happens, the judge or the caseworker who didn't remove the kid gets blamed. But nobody gets blamed when a kid dies out of sight in a group home, and this report shows kids are not necessarily better off removed. The better approach is to try to leave them with families first -- hence the title of the bill -- and give that family the support it needs. In the end, it would cost the government a lot less money, and keep families together. And that's why a lot of conservatives actually support this reform. The problem, as I've written about before, is the weird lobbying power of group homes that profit off of separating children from their families. And so it was beaten by a single vote last year. This year, though, reform could finally happen, if enough pressure is applied. My story with Aida Chavez here. Please forward to anybody who'd care, tweet it, share, etc. By pushing the report to colleagues, Sen. Ron Wyden, the committee's top-ranking Democratic member, said he and panel chair Orrin Hatch, R-Utah, are trying to "light a big fire around" how important it is to fix the child welfare system's flaws. The report was prompted in part by a BuzzFeed investigation into the company two years ago. The committee found that 86 children had died in the company's care over a 10-year period, and the firm had conducted internal investigations in only 13 cases. The political problem for foster children is a structural one. It would be hard to think of a group with less lobbying power in Washington, D.C., while the group homes that warehouse children are making significant profits off each one and are loath to see that income dry up. Late last year, Hatch and Wyden made a push to reform the system with a bill that would privilege family settings over group homes, but a Baptist group home network in North Carolina persuaded its Senate delegation to block the legislation. Meanwhile, state agencies and judges tend to be quick to pull a child from their home at the first sign of trouble, reasoning that the safest move is to act rather than leave them with a parent. If tragedy strikes while a child is at home, media attention condemns the parents and the system that left the child there. But when tragedy strikes a child who was hastily moved into a group home, the death often passes unnoticed. The failure of the child welfare system is a "real moral blot on the country," Wyden said, and children "aren't going to have an army of lobbyists behind them," so it's up to lawmakers to show how serious the failures of the system are. Wyden said he hopes this report shocks opponents of the Families First bill into taking a second look. You're getting this email because you either signed up for it or you took a survey and opted in to this newsletter -- or, probably, you declined to opt out. Either way, I hope you're enjoying it. I'm the Washington bureau chief at The Intercept, and I send this several times a week. If you see an ad here, it's there because sending mass emails turns out to be really expensive. I'm not making any money off of it; it goes to the email service provider and just defrays the cost a bit. If you want to contribute directly to help keep the thing running, you can do so here, though be warned a donation comes with no tote bags or extra premium content or anything. Or you can buy a copy of Out of the Ooze: The Story of Dr. Tom Price, the first book put out by Strong Arm Press, a small progressive publishing house I cofounded. If somebody forwarded you this note, you can sign up to start getting your own copy here.